… does it catch my eye? What is it about the ancient Egyptian combination of semi precious stones and gold that appeals to us so much? 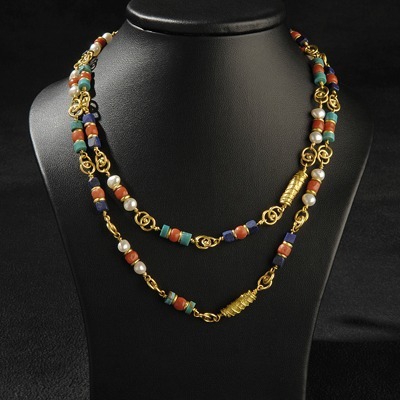 Every civilisation has used s emi precious stones and gold, but there’s just something about lapis and turquoise and coral and pearls and gold all combined that makes a perfectly winning formula. Even if you don’t wear those colours generally, it’s still a tempting combination. 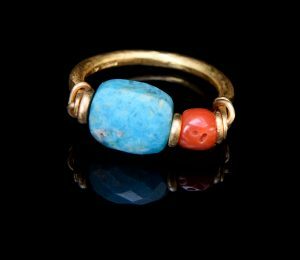 The ancient Egyptians took their jewellery very seriously and it was worn by both men and women all the time, not just for smart occasions. Stones all had magical properties – lapis for wisdom, turquoise for protection and so on, and jewellers took great care to combine the right stones for maximum mystical effect. In fact the Egyptians took their jewellery so seriously that they were even buried with it to ensure that all its magical properties carried on in the after life. None of this leaving it in the will for future generations to enjoy. It was Royalty who got the gold, and the general populace had their jewellery made in copper because it was affordable, and silver had not yet been imported to Egypt; gold and copper were mined there and so readily available. This means, of course, that there’s a little bit of royalty in any of us who buys a piece of Polly’s Egyptian inspired treasure! A little known factoid…. the ancient Egyptians were masterful stone forgers; they could make perfectly believable emeralds, tiger’s eye, turquoise… whatever you fancied, they could manufacture one for you.